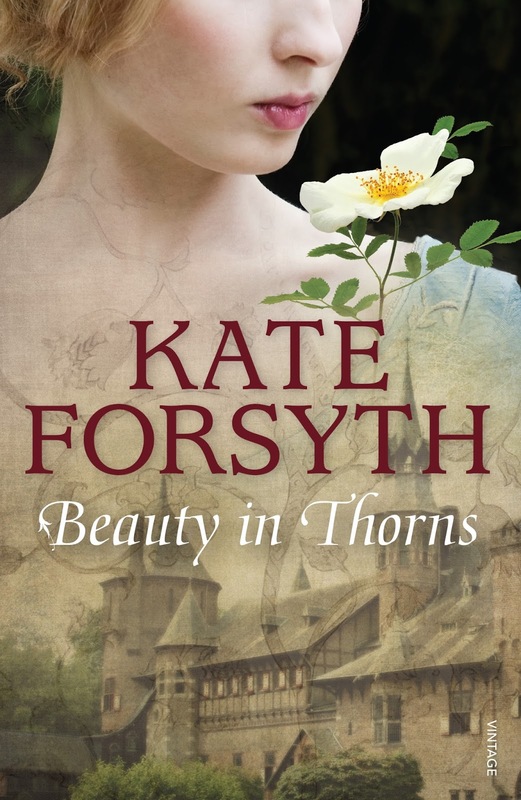 I have been most fortunate this month because Kate Forsyth, author of Bitter Greens, let me have a read of her new novel Beauty in Thorns. I was very eager to read it because I have been talking to Kate for a while now about the lives and loves of Pre-Raphaelite muses and as the author of a novel about Pre-Raphaelite women I'm always delighted to find another book on the same subject. Kate has taken the familiar threads of the Pre-Raphaelite story and made a novel that spans the birth of the Brotherhood right to the end of the century, centering around the lives of the muses, wives and lovers of the artists. This is a monumental piece of work. Spanning fifty years and almost five hundred pages, Beauty in Thorns covers some familiar ground but in a way that will make you question everything you thought you knew about the Pre-Raphaelite women. 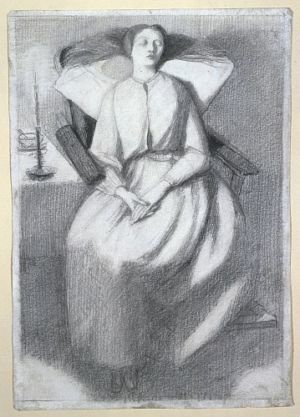 Predominantly following the lives of Elizabeth Siddal, Jane Morris and Georgiana Burne-Jones, we trace them from childhood, through love and marriage (not necessarily with the same man), troubles, disillusionment and immortality. 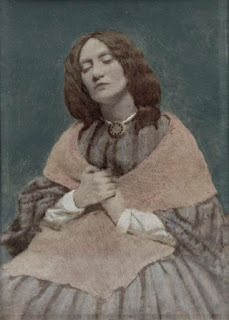 It would be hard to see how a novelist could take scenes as ingrained in Pre-Raphaelite lore as Lizzie in the bath and make it new, but throughout her prose, Kate adds layers of character to these women, making them more than just the muses of their lovers, but as people with motivation, needs, desires and dreams. Taking the recurring theme and image of sleeping beauty, not only in Edward Burne-Jones monumental murals but also the lives of the women, Kate reveals girls awaiting princes, women having to allow men the active role in romance, and the fortunes of women who rebel against these constraints. Not only are the women the unwilling heart of a passive fairytale, waiting in their bower for a prince, but also there is reflection on the other roles women take in such tales, cursing their own daughters to isolation through any transgressions of the mothers. Q. 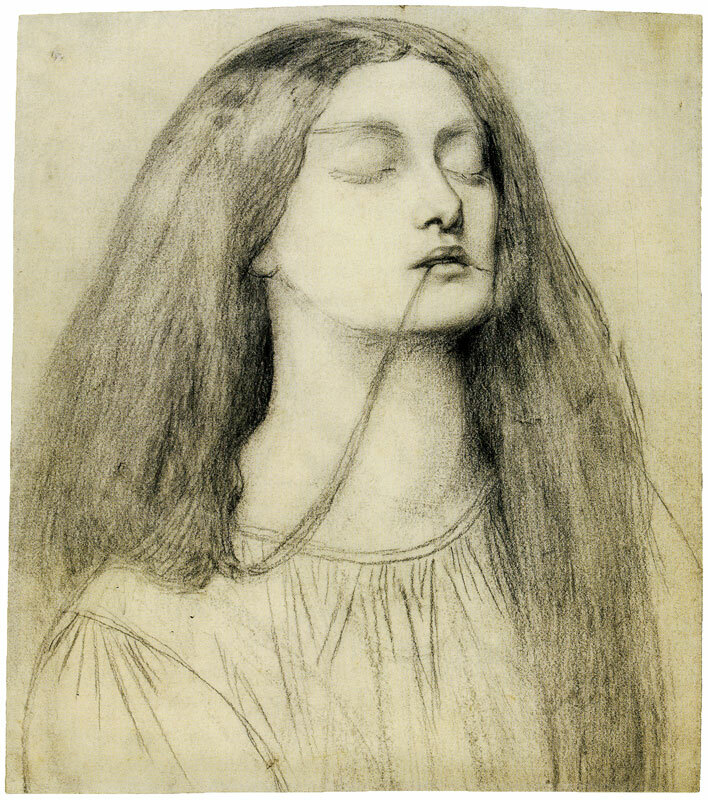 In Beauty in Thorns, both Ned Burne-Jones and Lizzie Siddal change their names on Rossetti's suggestion/demand. Why do you think they allowed him that power and why do you think he needed it? I think both Lizzie Siddal and Ned Burne-Jones admired Rossetti, and looked up to him. Rossetti was very aware of the importance of names in both shaping one’s sense of self-worth and in creating a persona for public consumption. He had changed his own name from Gabriel Charles Rossetti to Dante Gabriel Rossetti only a few years earlier. Q. I think some readers will be shocked by how brutal Jane Morris' origins are portrayed - why did you give her such an unromantic back story? I think it is my job to be as truthful as possible about the lives of my characters, not to romanticise them. Janey Burden was a slum girl. Her father worked as a groom in the stables of a busy inn in Oxford. Her mother was a laundress (when she could get work) and illiterate. Janey lived with her parents and brother and sister in a single room not much larger than one of the horses’ stalls. Her eldest sister died of tuberculosis when only a child. It is known her father could be violent, as he was charged with assault on a neighbour. It is known they were destitute, because her father was unable to pay the parish poor rate. It is also known her mother and father’s relationship was troubled because her parents separated after Robbie Burden refused to pay for his wife’s debts. Janey would, most probably, have gone to the local parish school till she was twelve, and then it is likely she would have worked as a laundress, seamstress, or scullery-maid. We don’t know, because she never spoke about her childhood. When John Mackail was writing his biography of her husband, William Morris, he wished to talk about Jane’s background. She refused to tell him anything or let him include a drawing of where she had once lived. Of course it was. He was a man, university educated, and born in a respectable middle-class family. He had no idea what it would be like to be a girl growing up in a rookery. In the 1850s, the investigative journalist Henry Mayhew described similar slums in London as ‘wretched dens of infamy, brutality and vice’. Sexual exploitation, child labour, dirt, disease and drunkenness were all sides effects of such abject poverty, and Janey would have seen it all – and quite likely suffered it too. One of the few things that is known about Janey’s childhood is that she gathered violets in the meadows and woods outside Oxford, most probably to sell on street corners. Later, after she became engaged to William Morris, she was sent away to learn how to be a lady. She was taught how to enunciate properly and how to play the piano and embroider. It is believed that Janey was the inspiration for the character of Anne Brown in Vernon Lee’s 1884 novel Miss Brown, which in its turn inspired George Bernard Shaw’s 1914 play Pygmalion, in which the flower seller Eliza Doolittle is plucked from the streets and taught how to speak and act, just as Jane Burden was by William Morris. Interestingly, Shaw was very close to the Morris family, living for some years in a ménage-a-trois with May Morris and her husband. Rather than romanticising Jane Burden’s childhood, I felt it was important to show just what a tough and brutal life she must have had. The way that she transformed herself – teaching herself to speak Italian, reading widely, and creating beautiful pieces of textile art – is such a testament to her intelligence and strength of character. A key source for me in imagining Janey’s childhood and adolescence was the essay, ‘Where Janey Used to Live’ by Margaret Fleming, published in The Journal of William Morris Studies (Winter 1981). Also useful was Jan Marsh’s dual biography Jane and May Morris: A Biographical Story 1839-1938 (1986), Jane Morris: The Burden of History by Wendy Parkins (2013) and London Labour and the London Poor: A Cyclopædia of the Condition and Earnings of Those That Will Work, Those That Cannot Work, and Those That Will Not Work, by Henry Mayhew (1862). Q. Traditional narratives have Rossetti and Lizzie's relationship as sexless but that isn't the case here. What made you interpret them that way? Early biographers of Dante Gabriel Rossetti did indeed argue that he and Lizzie Siddal never consummated their love before marriage, despite eleven years of close association including periods when Lizzie was essentially living with Gabriel in his lodgings. 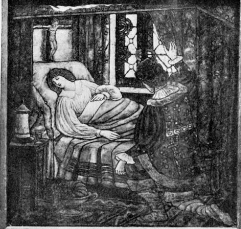 One of those biographers was his brother William Rossetti who was doing whatever he could to save Rossetti’s reputation from accusations he was a seducer and a philanderer. These same biographers named Lizzie ‘frigid’, ‘wan’, ‘passive, ‘sluggish’, ‘inert’, ‘a melancholy doll’, ‘depressive’, ‘manipulative’ and ‘a hypochondriac.’ The best that was said of her was said she was ‘frail and sensitive’. I utterly refute those readings of her character. You only need to look at her behaviour to see they are both untrue and unkind. Right from the very beginning of her association with the Pre-Raphaelites, Lizzie showed her willingness to transcend rules. She agreed to model in the first place, despite the common assumption that artists’ models were all prostitutes. She posed with legs bared, in boys’ clothes, for Walter Deverell’s painting of ‘Twelfth Night’. 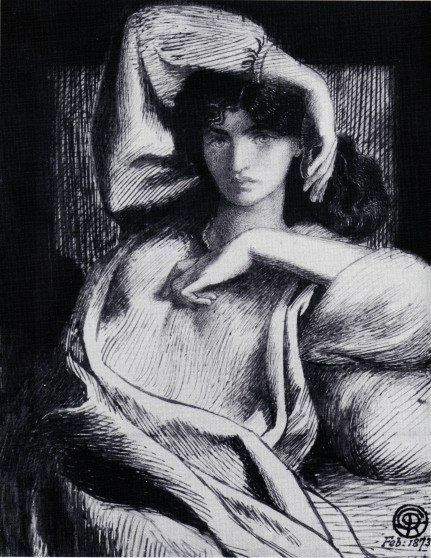 She modelled for Rossetti in suggestive poses, her hair loose, dressed only in her chemise. She defied convention and moved out of her parents’ home, which was almost unheard of at the time. 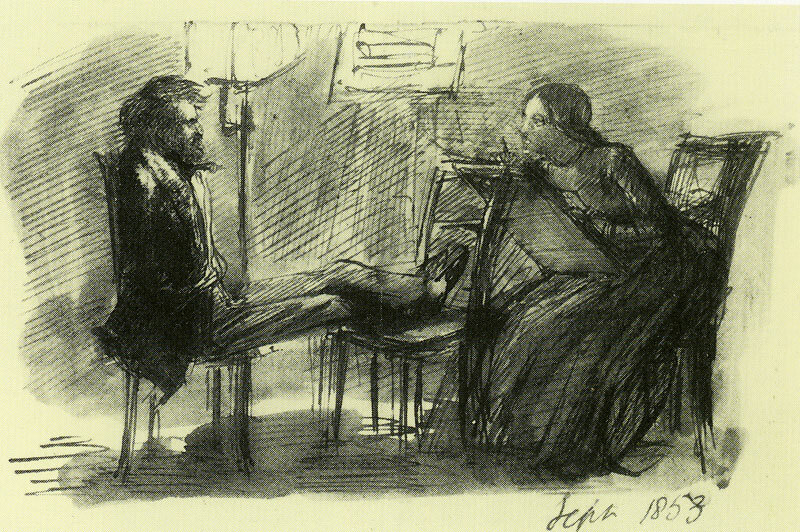 William Bell Scott caught her and Gabriel alone, reading poetry together, in the twilight, something which no good Victorian maiden would ever do. She slept at Gabriel’s apartment, and invited him into her hotel room. She wanted to be an artist herself, and drew and painted and wrote poetry in defiance of society’s strictures on such activities being unladylike. She is absolutely right in that there is no concrete evidence one way or another. I would, however, point to Gabriel’s myriad drawings of Lizzie sleeping, reading, drawing and sewing, her hair loose on her shoulders, in déshabillé, to show the level of intimacy between them. Q. You offer a bravely visceral depiction of Lizzie's eating disorder. Why was it important to show that side of her character so graphically? One of the difficulties of writing biographical fiction is that the author cannot sit on the sidelines, and say, ‘it is believed that …’ or ‘it is possible …’ A novelist needs to try and find the explanation that seems most likely, and then bring it to life on the page. The possibility that Lizzie might have had an eating disorder was first suggested by Elaine Shafer in a 1985 essay, ‘The Bird in the Cage’. Anorexia nervosa and other eating disorders are mental illnesses with devastating physical consequences. They have the highest mortality rate of any psychiatric disorder. Eating disorders cannot, and must not, be dismissed as a form of emotional blackmail (even though they are commonly misunderstood in such a way). In 1854, Ford Madox Brown writes in his diary that Lizzie was ‘thinner and more deathlike and more beautiful and more ragged than ever’. In 1857, Gabriel wrote that she is ‘not better in health or eating anything to speak of’. This was the same year in which Lizzie refused to touch food for two weeks, resulting in her admission to the health spa in Matlock. Then, at the inquest into her death in 1862, he told the court ‘she could not sleep at times nor take food’ (insomnia is a common side effect of anorexia). Most striking is the visual evidence of Gabriel’s drawings and paintings which show her physically dwindling. Nowadays, when we see a young woman wasting away, refusing food, or vomiting after meals, we would suspect anorexia nervosa or bulimia nervosa. However, in the mid-19th century such pronounced emaciation was normally attributed to tuberculosis, commonly called ‘consumption’ because it seemed to consume the sufferer. The first medical identification of eating disorders was made in 1868 (six years after Lizzie’s death), when Sir William Gull, the Queen’s physician, delivered a paper describing a digestive disorder with no known cause, which he called ‘hysteric apepsia’ (apepsia means ‘without digestion’). In 1873 (eleven years after Lizzie’s death), Ernest-Charles Lasègue, a French physician, published a paper entitled De l’Anorexie Histerique which was the first real examination of the idea that the wasting away of these young women could be caused by self-starvation. It was not understood as a mental illness, however, but as a ‘maladie imaginaire’. Sir William Gull consequently undertook further investigation and coined the term ‘anorexia nervosa’. If Lizzie was an anorectic, she and her family and friends would have had absolutely no idea what was wrong with her. Any ‘curious perversions of appetite’, as Lasègue named them, such as binge eating, secret eating, hoarding of food, purging, refusal of food, or food-related rituals, would have seemed, at best, a hysterical demand for attention. It is my job, as a novelist, to bring Lizzie’s inner world to life. I have to show what it would have felt like, smelt like. I have to show the revulsion and confusion of those who loved her, and I have to show Lizzie’s own self-loathing and shame. Those scenes were difficult to write, and yet I feel passionately that they explain so much of the difficult emotional dynamic between Gabriel and Lizzie and others who knew her. Q. There is a distinct difference in the dynamic of Jane and Rossetti than has previously been portrayed (which I won't reveal here because of spoilers). How difficult is it getting to the truth of such a famous relationship? Once again, I examined the psychology of the people involved and made decisions about what their background and behaviour revealed about their inner lives. I agree with her. 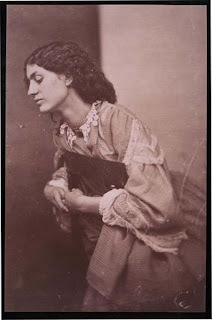 I found Janey Morris one of the most interesting women in the Pre-Raphaelite Sisterhood – fiercely intelligent, strong-willed, and free of conventional Victorian morality thanks to her wretched upbringing in the slums of Oxford. I also believe that Dante Gabriel Rossetti has been unfairly cast as a libertine and a philanderer. Which is not to say that I believe him to be altogether free of sexual indiscretion; I simply do not believe he acted quite as carelessly and unkindly as many believe. He was clearly racked with guilt and remorse after Lizzie’s death, and he was, in his youth at least, idealistic and romantic. Wendy Parkins also argues that the traditional view of Dante Gabriel Rossetti as seducer and Janey Morris as the seduced deprives her of any emotional agency. I believe this to be an untrue reading of the relationship between the two. Janey risked everything for her love for Gabriel, and I believe she did so joyously and determinedly. Q. I love the way that certain situations echo the paintings, so I have to ask - do you have a favourite Pre-Raphaelite painting? Oh, so many! It was so wonderful to spend such a long time scrutinising some of the most exquisite art ever created. 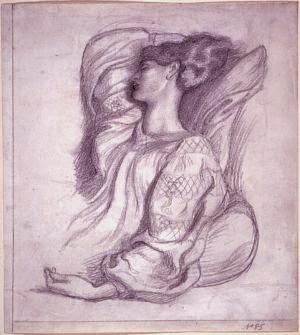 My favourites include ‘Prosperina’ by Dante Gabriel Rossetti, where he painted Janey Morris as the goddess of spring, condemned to spend half of every year in the world of the dead; John Millais Everett’s painting of Lizzie Siddal as ‘Ophelia’; Rossetti’s painting of Lizzie as ‘Francesca da Rimini’ and ‘Beata Beatrix’; Edward Burne-Jones’s multitude of angels, and ‘Love in Ruins’ and ‘Merlin and Nimue’; and Jane Morris and her daughter May’s gorgeous embroideries. And – of course! 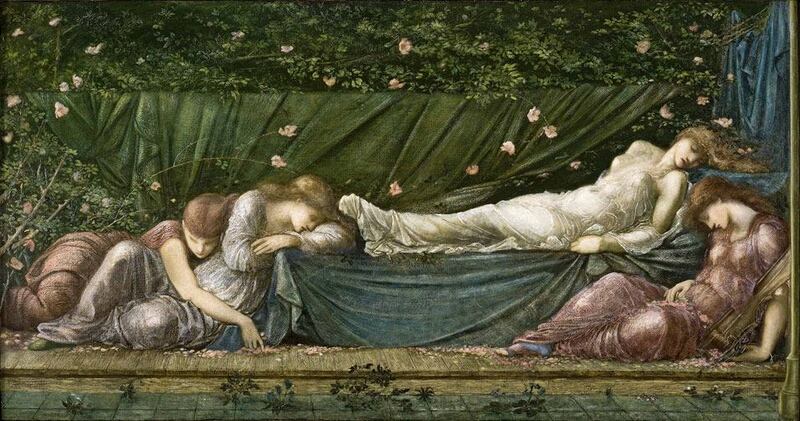 The many ‘Sleeping Beauty’ drawings and paintings that Edward Burne-Jones painted over his lifetime, which give me the key narrative thread in Beauty in Thorns. Many, many thanks to Kate for allowing me read an advance copy of her book and for answering my questions. At present, Beauty in Thorns has only been released in Australia but until it has a worldwide release, it is possible to get a copy through The Book Depository. Miss Fanny Bunn was born in the autumn of 1870 in West Bromwich, Staffordshire. Her family was living at the time with her maternal grandfather, a grocer. The family was young, and Levi and Emma Bunn had managed to have two daughters within two years of their marriage. Levi's family business was coach-building, and his father Samuel had been a coachsmith before him. 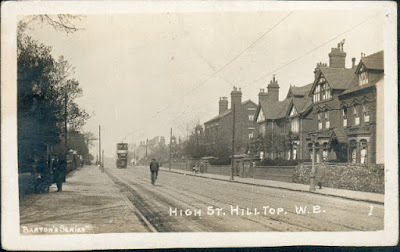 However in 1850 Samuel, who lived at Hill Top, West Bromwich, had been declared bankrupt, which might explain why they were living with Emma's parents. By later census returns it seems that Emma still served in her father's shop until her husband became comfortably off, financially speaking. By 1881, Levi's occupation was listed as both book merchant and brass hinge maker. They had moved to their own home in Walsall Street, West Bromwich and they were one of the few families on the street who kept a servant, 16 year old Elizabeth Campion. Fanny and her slightly older sister Rebecca were at school, and when they left school, Fanny continued on to art school, to be specific the Birmingham Municipal School of Art. By 1891, the Bunn family fortunes were on a pretty even keel. 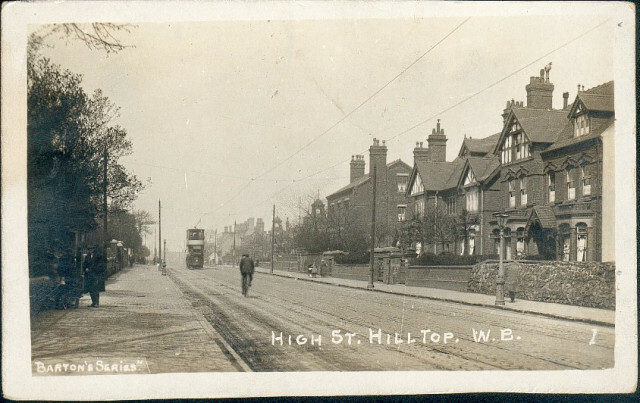 They had moved to Beeches Road in West Bromwich, a very pleasant red-brick terrace of houses with gothic-arched windows. Levi Bunn was listed as a Liberal Council candidate in the 1890s. 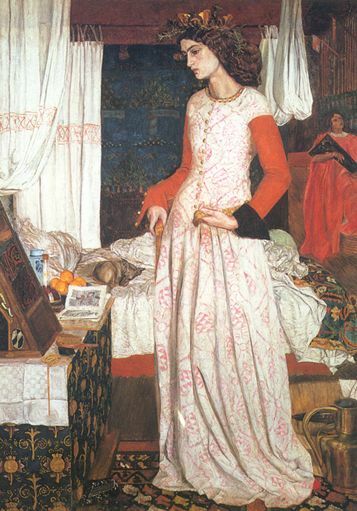 Fanny's work was winning awards - The Legend of Sandalphon was admitted to the National Art Competition at the Victoria and Albert Museum, where it was exhibited (this piece was stamped 'Examined South Kensington') from Birmingham. Sandalphon is an archangel responsible for protecting unborn children. The weeping angels either side of the archangel do raise some questions about Fanny's experiences of pregnancy as this is not a happy picture. In 1904 she won the Princess of Wales scholarship of £25 for her piece entitled The Victor, now in the collections of Birmingham Museum and Art Gallery. 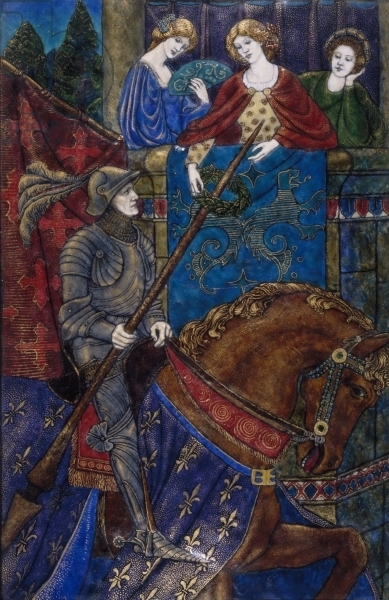 The enamel panel, reported in the London Daily News as 'well disposed, rich in colour' was somewhat dismissed by adding 'although the types of women looking down on the knight might have been more happily chosen.' Charming. However the Arts and Craft Magazine's coverage of the National Art Competition in 1904 praised her 'brilliant and harmonious' colouring of the scene and 'exquisite translucence of the enamels', lifting her work above the 'commonplace'. 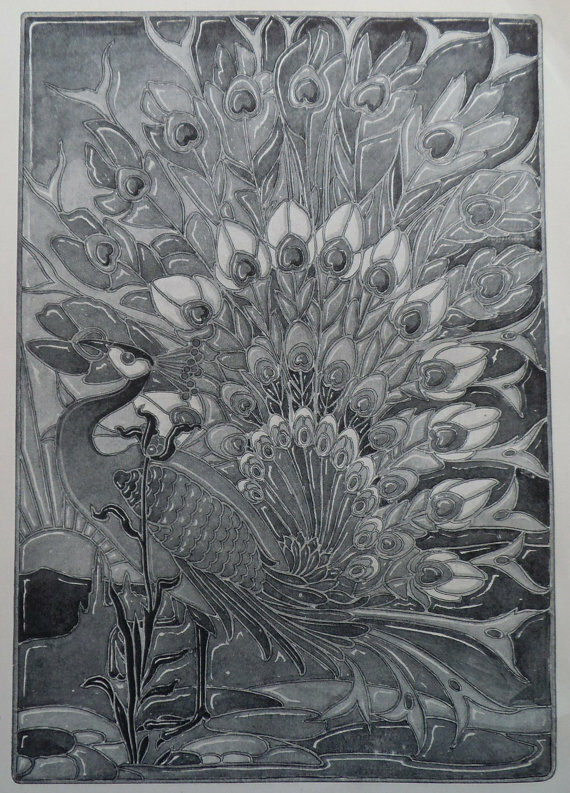 Seemingly aware that her name was not exactly a glamorously artistic one, Fanny Bunn briefly took on the pseudonym 'Peacock', which was also the subject of her prize winning design for an enamelled decorative panel in 1901. 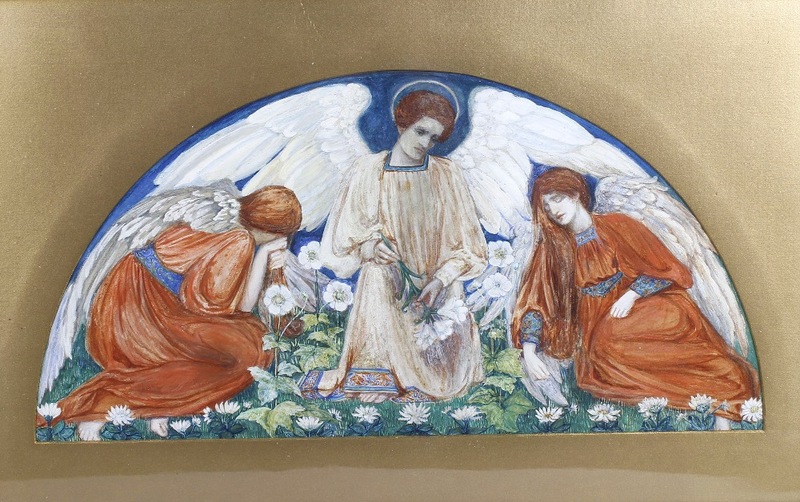 She also won further awards, this time a gold medal and £25, for her enamelled panel of La Belle Dame Sans Merci, in 'rich tones of blue, violet and peacock' (as reported in East and South Devon Advertiser in 1902). 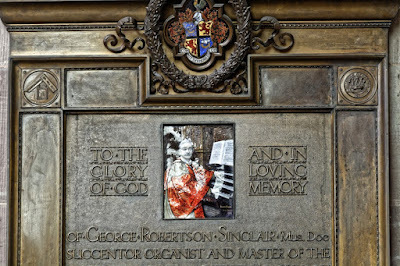 This piece resides in the V&A, the very museum where it won the medal. 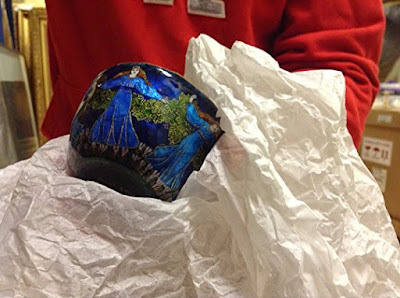 The quality of her work and her prizes made her famous and brought her back to the Birmingham school as a teacher of enamelling in 1905. Whilst most of Fanny's work is rarely on display these days, one piece is on constant show. 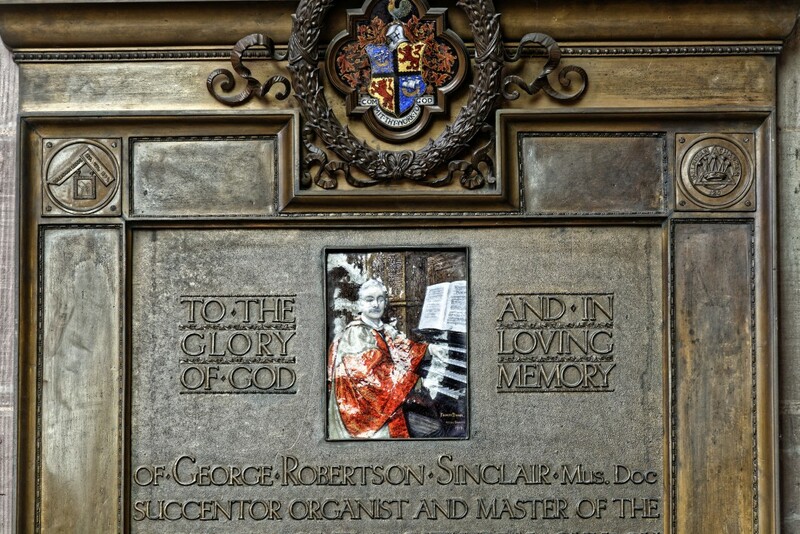 Her enamelled portrait of the organist and musical director at Hereford Cathedral, George Robertson Sinclair (d.1917) is on the wall of the cathedral if you fancy seeing it. By 1911 census, Levi and his two daughters were still living at Beeches Road, Emma having died a decade before, just after the last census. Fanny was listed as an artist but neither Rebecca or Levi worked, and they had a young maid to take care of the family. The last that we know of Fanny's work is the Royal Birmingham Society of Artists Autumn Exhibition of 1921, where Case 2 in Gallery 3 held the trinket bowl entitled Fairies and a silver powder box Memory.